In an apparent move to strengthen the influence of his supporters within the regime and streamline economic reforms, Syrian president-to-be Bashar Assad dismissed Prime Minister Mahmoud al-Zu'bi and most other members of the cabinet earlier this month. The decree, officially enacted by his ailing father, President Hafez Assad, followed a stream of leaks to Arab press over the last several weeks forecasting the first major government shakeup in Damascus in nearly a decade. The new prime minister, Muhammad Mustafa Miru, is a well-known technocrat and member of the Central Committee of the ruling Ba'ath Party. Miru, 58, was born in the city of al-Tal, around 35 km north of Damascus. He obtained a degree in Arab Literature from Damascus University and was the secretary-general of the Arab Teachers' Union in Cairo during the 1970's, after which he obtained a PhD from a Soviet university (according to one report, this was the Arab Studies Institute in Moscow, but others have said that the university he attended was in Soviet Armenia).1 Miru served as governor of the of the southern province of Daraa from 1980 until 1986, when he was appointed governor of the northeastern province of al-Hasakah. 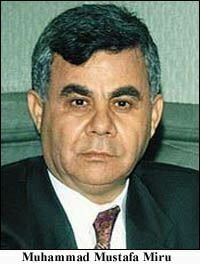 Since 1993 he has served as governor of Aleppo province, earning a reputation for honesty and intolerance of corruption (like King Hussein of Jordan, following Haroun al-Rashid's example, Miru habitually traveled the streets in disguise to gauge his subjects true sentiments). He is married and has three daughters and two sons. Press reports in Syria have said that Miru is an expert on Syrian-Turkish relations. Defense minister Mustafa Tlass, Interior Minister Mohammed Harba, Finance Minister Khaled Mahayni and ten other ministers retained their positions in the new 36-member cabinet (see below). Among the new faces are Planning Minister Issam Zaim, a well-known economist and Information Minister Adnan Omran, a former deputy secretary-general of the Arab League and former ambassador to Britain. Economic issues clearly constitute a second major reason for the change in government. Syrian exports dropped by 20% in 1999 and the value of agricultural production dropped from $1.1 billion to $425 million. For years, the country has been plagued by what Syrian economics professor Riyad al-Abrash calls "a culture hostile to capital." Speaking at a seminar of the Syrian Association for Economic Sciences, a think-tank chaired by Bashar since 1994, Abrash warned that "pervading corruption . . . will limit investment and development in coming decades. "4 The fight against corruption was also the primary topic of discussion when the national leadership of the ruling Ba'ath Party convened last month. Bashar intends to encourage foreign direct investment in Syria by stamping out corruption and reforming government regulations that inhibit free enterprise. In particular, he advocates far-reaching reforms in the banking sector, the establishment of a stock market and the removal of harsh penalties for dealing in hard currency. In addition, Bashar concluded that Syria's negotiations with the European Union to join a free trade zone in 2010 and its desire to eventually become a member of the World Trade Organization would be best served if some new faces were present in the Syrian government. While the necessity of economic reforms undoubtedly influenced the formation of the new government, it should be noted that these same reasons were given for the appointment of Mahmoud Zu'bi in 1987 and that of his predecessor, Abderraouf al-Kasm in 1980. 1 Al-Hayat, 8 March 2000. 2 See "Syria Replaces Veteran Military Intelligence Chief," Middle East Intelligence Bulletin, February 2000. 3 Al-Quds Al-Arabi, 20 March 2000. 4 Al-Safir, 28 February 2000. 5 Al-Hayat, 7 March 2000.